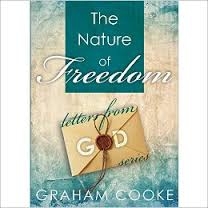 The Nature of Freedom | Karmal Books online Christian books and media store. Read a letter from God explaining how He thinks about common life struggles & the extraordinary depths of freedom available to you. Learn how to see as He sees, think how He thinks & allocate His nature of freedom to all areas of your life! A powerful devotional tool that enables people to understand a wide variety of truths purely from Gods perspective. The book is deeply relational, highly personal and carries the same simple, practical and profound theology that Jesus used throughout the Gospels. It examines the work of the Cross, the demise of your old nature, and the development of the new man as God sees it. This unique perspective will unlock any area where you feel stuck in your spiritual experience. It will provide you with a wisdom that enables you to know how God sees issues, how He thinks about them, and the way He would speak to them, empowering you to step into that place He has set aside for you in the truth. As a journal of your journey into the nature of freedom, there are questions for consideration, processing tools and activations that will release you into a practical encounter with the Lord.